JERUSALEM, May 8 2013 (IPS) - Since Israel secretly deported over 1,000 Sudanese refugees several months ago, sending them back to Sudan and threatening to deport hundreds more Sub-Saharan African refugees, Israeli authorities have suspended this practise in the face of international outrage and condemnation by the United Nations. Yet refugees, even legal ones, nevertheless continue to leave in fear of deportation as well as abuse amid a climate of racism and frequent attacks against African refugees in Israel. Still, in some ways the situation has improved, Sharon Harel from the United Nations High Commission for Refugees (UNHCR), told IPS. “While in theory there has been no official change in the deportation policy of Sub-Saharan refugees from Israel, in practise the deportations of Sudanese has ceased and to date no forcible repatriation of Eritreans has taken place,” she explained. In February, Israeli media exposed the mass deportation of Sudanese refugees to their home countries and to third countries. Refugees were being pressured to sign deportation forms or face at least three years’ detention without access to due process. While Israeli authorities claimed the refugees signed forms “voluntarily”, the UNHCR demanded an explanation and lambasted the claim, stating the deportations had taken without its knowledge and without it being consulted to supervise the process. “The refugee claims were not examined. [Nor] were the refugees told they had the right to challenge the deportations,” Harel told IPS, adding most of the refugees were already in prison, many for at least six months and others for several years. “They don’t receive full access to the refugee apparatus, and when there’s no access to the refugee apparatus that can lead to their release, then there is no voluntary return,” Harel explained. An Israeli Interior Ministry committee subsequently advised the Israeli government to ignore a demand from UNHCR for an explanation. For years Israeli authorities have known UNHCR’s position on Israel’s systematic deportation of refugees. Michael Bavli, a senior adviser to UNHCR, told the head of Israel’s Immigration Administration in 2008 that “deporting Sudanese to Sudan would be the gravest violation possible of the refugee convention that Israel has signed – a crime never before committed”. Sudan defines Israel as an enemy country and has warned that it will punish any of its citizens who set foot in Israel. Consequently, human rights groups have said, deportation constitutes a violation of Israel’s most basic obligations under international law. According to the 1951 U.N. Refugee Convention, to which Israel is a signatory, Sudanese and Eritrean citizens cannot be deported from Israel. “In deporting people to Sudan, Israel [crosses] a red line and is not only violating its most basic obligation under international law, but demonstrating cruelty, hard-heartedness and indifference to the fate of human beings,” Assaf, the Aid Organisation for Refugees and Asylum Seekers, said in a statement. In addition to stating that the refugees had been “voluntarily” sent out of the country, Israeli authorities also claimed to be protecting the interests of the refugees by sending them to a third country where they wouldn’t face persecution from authorities in their own countries. T.H., an Eritrean army deserter, feared persecution and imprisonment if he returned to Eritrea. After being arrested, T.H. was given the choice of “volunteering” to be sent to Uganda or being incarcerated for three years. Upon arrival in Uganda he was refused entry and forcibly flown to Cairo, where he was detained until Israeli authorities relented, under pressure from Israel’s attorney general, allowing him to return to Israel. 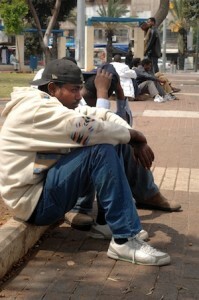 Despite the improvement in the situation, many Sub-Saharan refugees remain tense about their prospects in Israel. In interviews with IPS, several Eritreans were reluctant to talk, refused to have their photos taken, and answered questions quickly before hurrying away.